From personal accounts, to detailed historical discoveries, Hebron is proud of it's three new authors. The Begin Center auditorium was packed on Tuesday evening for the Hebron book launch. It's not every year that Hebron residents have books published, and this year there were three. Each book has a unique story to tell, and their authors spoke to the crowd about them. In-between each speech, Israeli musician Mati Arama performed. 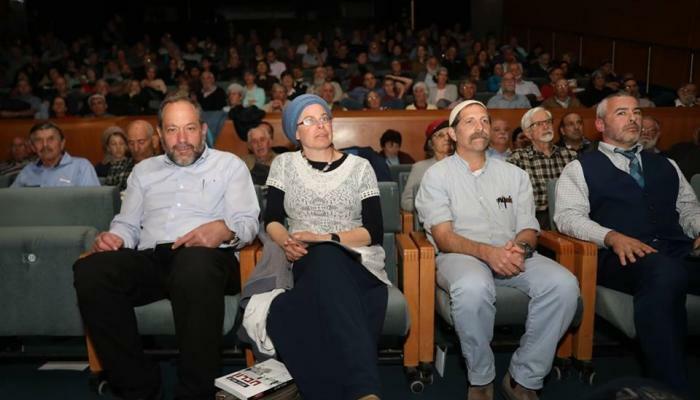 The book launch took place March 13th at the Menachem Begin Heritage Center in Jerusalem and featured Dr. Gershon Bar-Kochba, author of Inscription: Stone, Wood and Copper in the Cave of the Patriarchs, Noam Arnon, author of HaMaarah: Discoveries and Studies at the Cave of Machpela, and Tzipi Shlissel, author of Hebron Breaks the Silence. Dr. Bar-Kochba, a historian, lectured with many photos and charts, detailing the many overlooks mysteries of the Tomb of Machpela structure. For example, archways, and stone inscriptions reveal the history of the building. Built by King Herod the Great during the Second Temple Period, the building is arguably the oldest still- standing structure serving the same function for which it was built -- to memorialize the Matriarchs and Patriarchs buried in the caves beneath. Dr. Bar-Kochba's book is filled with color photos of his numerous excursions in the building, explaining the history dating back to the Crusader era, the Mamluke conquest and more. Dr. Bar-Kochba has also explored and cataloged the structures in the former Jewish ghetto of Hebron, today's Casbah. He previous published Temple in Flames: The Last Battle Story together with Aharon Horowitz. Arnon, the longtime Hebrew-language spokesperson for the Jewish community of Hebron, also delved into history during his lecture. He has the unique distinction of being one of the few people to actually descend into the underground cave. Back in 1981, Arnon was part of a small team who climbed into the underground staircase. It was here that they discovered human bones and pottery fragments, today housed at the Land of Judah Museum in neighboring Kiryat Arba. The entrance was since sealed up. The brief 1981 excavation was predated by a descent in 1967 overseen by Defense Minister Moshe Dayan, following the Six Day War. This marked the first time anyone had explored the cave in the past 700 years. Nevertheless, these explorations only revealed one corridor of the underground caverns. The full extent of what lays beneath remains a mystery. Since the 1267, the Mamlukes barred all non-Muslims from entering into the building. Arnon interviewed the few people, who before the land was liberated in 1967, were able to unofficially gain access inside the Tomb of Machpela complex. Shlissel's book is much more personal. The title being a take on the Breaking the Silence organization, she discussed the slander of the Jewish community by anti-Israel activists. Shlissel's personal history is detailed in the book. Her grandmother was a resident of the Old Yishuv of Hebron and survived the bloody 1929 massacre, after which the British expelled all Jewish residents. Although Arab residents brutally attacked their Jewish neighbors, upon the instigation of Haj Amin Husseini (who went on to become a supporter of Adolph Hitler), Shlissel's grandmother was one of the many saved by Arabs. An Arab man hid her and her sister in the back of a store while the mob attacked. Shlissel moved to Hebron in 1998 after her father Rabbi Shlomo Ra'anan was murdered by an Arab terrorist. The 63-year-old rabbi fought off an attacker who had climbed into their window at night. Rabbi Ra'anan was a grandson of the first Ashkenazic chief rabbi of Israel, Rabbi Avraham Yitzchak Kook. This personal history is part of the reason Shlissel feels so passionate about the city. For years she worked at the Hebron Heritage center in the historic Beit Hadassah museum.